The code for this chapter is in cumulative.py. For information about downloading and working with this code, see Section 0.2. PMFs work well if the number of values is small. But as the number of values increases, the probability associated with each value gets smaller and the effect of random noise increases. For example, we might be interested in the distribution of birth weights. In the NSFG data, the variable totalwgt_lb records weight at birth in pounds. Figure 4.1 shows the PMF of these values for first babies and others. 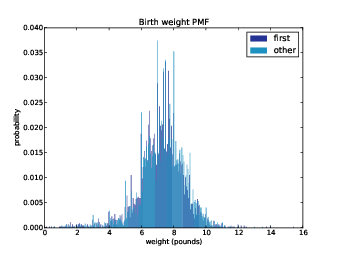 Figure 4.1: PMF of birth weights. This figure shows a limitation of PMFs: they are hard to compare visually. Overall, these distributions resemble the bell shape of a normal distribution, with many values near the mean and a few values much higher and lower. But parts of this figure are hard to interpret. There are many spikes and valleys, and some apparent differences between the distributions. It is hard to tell which of these features are meaningful. Also, it is hard to see overall patterns; for example, which distribution do you think has the higher mean? These problems can be mitigated by binning the data; that is, dividing the range of values into non-overlapping intervals and counting the number of values in each bin. Binning can be useful, but it is tricky to get the size of the bins right. If they are big enough to smooth out noise, they might also smooth out useful information. An alternative that avoids these problems is the cumulative distribution function (CDF), which is the subject of this chapter. But before I can explain CDFs, I have to explain percentiles. If you have taken a standardized test, you probably got your results in the form of a raw score and a percentile rank. In this context, the percentile rank is the fraction of people who scored lower than you (or the same). So if you are “in the 90th percentile,” you did as well as or better than 90% of the people who took the exam. As an example, if the scores in the sequence were 55, 66, 77, 88 and 99, and you got the 88, then your percentile rank would be 100 * 4 / 5 which is 80. The result of this calculation is a percentile. For example, the 50th percentile is the value with percentile rank 50. In the distribution of exam scores, the 50th percentile is 77. The difference between “percentile” and “percentile rank” can be confusing, and people do not always use the terms precisely. To summarize, PercentileRank takes a value and computes its percentile rank in a set of values; Percentile takes a percentile rank and computes the corresponding value. Now that we understand percentiles and percentile ranks, we are ready to tackle the cumulative distribution function (CDF). The CDF is the function that maps from a value to its percentile rank. The CDF is a function of x, where x is any value that might appear in the distribution. To evaluate CDF(x) for a particular value of x, we compute the fraction of values in the distribution less than or equal to x. This function is almost identical to PercentileRank, except that the result is a probability in the range 0–1 rather than a percentile rank in the range 0–100. We can evaluate the CDF for any value of x, not just values that appear in the sample. If x is less than the smallest value in the sample, CDF(x) is 0. If x is greater than the largest value, CDF(x) is 1. Figure 4.2: Example of a CDF. Figure 4.2 is a graphical representation of this CDF. 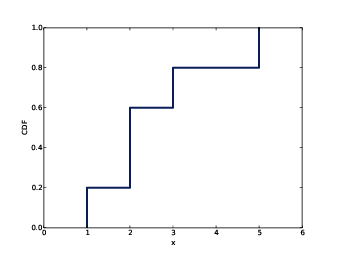 The CDF of a sample is a step function. Prob(x): Given a value x, computes the probability p = CDF(x). The bracket operator is equivalent to Prob. 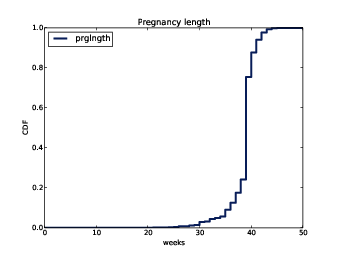 Value(p): Given a probability p, computes the corresponding value, x; that is, the inverse CDF of p.
Figure 4.3: CDF of pregnancy length. Figure 4.3 shows the result. One way to read a CDF is to look up percentiles. For example, it looks like about 10% of pregnancies are shorter than 36 weeks, and about 90% are shorter than 41 weeks. The CDF also provides a visual representation of the shape of the distribution. Common values appear as steep or vertical sections of the CDF; in this example, the mode at 39 weeks is apparent. There are few values below 30 weeks, so the CDF in this range is flat. It takes some time to get used to CDFs, but once you do, I think you will find that they show more information, more clearly, than PMFs. CDFs are especially useful for comparing distributions. For example, here is the code that plots the CDF of birth weight for first babies and others. Figure 4.4: CDF of birth weights for first babies and others. Figure 4.4 shows the result. Compared to Figure 4.1, this figure makes the shape of the distributions, and the differences between them, much clearer. We can see that first babies are slightly lighter throughout the distribution, with a larger discrepancy above the mean. PercentileRank(x): Given a value x, computes its percentile rank, 100 · CDF(x). Percentile(p): Given a percentile rank p, computes the corresponding value, x. Equivalent to Value(p/100). Percentile can be used to compute percentile-based summary statistics. For example, the 50th percentile is the value that divides the distribution in half, also known as the median. Like the mean, the median is a measure of the central tendency of a distribution. Actually, there are several definitions of “median,” each with different properties. But Percentile(50) is simple and efficient to compute. Another percentile-based statistic is the interquartile range (IQR), which is a measure of the spread of a distribution. The IQR is the difference between the 75th and 25th percentiles. More generally, percentiles are often used to summarize the shape of a distribution. For example, the distribution of income is often reported in “quintiles”; that is, it is split at the 20th, 40th, 60th and 80th percentiles. Other distributions are divided into ten “deciles”. Statistics like these that represent equally-spaced points in a CDF are called quantiles. For more, see https://en.wikipedia.org/wiki/Quantile. Suppose we choose a random sample from the population of live births and look up the percentile rank of their birth weights. Now suppose we compute the CDF of the percentile ranks. What do you think the distribution will look like? Then we generate a sample and compute the percentile rank of each value in the sample. sample is a random sample of 100 birth weights, chosen with replacement; that is, the same value could be chosen more than once. ranks is a list of percentile ranks. Finally we make and plot the Cdf of the percentile ranks. 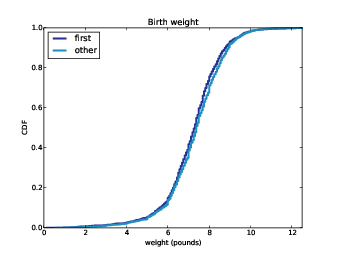 Figure 4.5: CDF of percentile ranks for a random sample of birth weights. Figure 4.5 shows the result. The CDF is approximately a straight line, which means that the distribution is uniform. That outcome might be non-obvious, but it is a consequence of the way the CDF is defined. What this figure shows is that 10% of the sample is below the 10th percentile, 20% is below the 20th percentile, and so on, exactly as we should expect. Choose a percentile rank uniformly from the range 0–100. Use Cdf.Percentile to find the value in the distribution that corresponds to the percentile rank you chose. Cdf also provides Sample, which takes an integer, n, and returns a list of n values chosen at random from the Cdf. Percentile ranks are useful for comparing measurements across different groups. For example, people who compete in foot races are usually grouped by age and gender. To compare people in different age groups, you can convert race times to percentile ranks. A few years ago I ran the James Joyce Ramble 10K in Dedham MA; I finished in 42:44, which was 97th in a field of 1633. I beat or tied 1537 runners out of 1633, so my percentile rank in the field is 94%. In my age group, denoted M4049 for “male between 40 and 49 years of age”, I came in 26th out of 256. So my percentile rank in my age group was 90%. If I am still running in 10 years (and I hope I am), I will be in the M5059 division. Assuming that my percentile rank in my division is the same, how much slower should I expect to be? There were 171 people in M5059, so I would have to come in between 17th and 18th place to have the same percentile rank. The finishing time of the 17th runner in M5059 was 46:05, so that’s the time I will have to beat to maintain my percentile rank. For the following exercises, you can start with chap04ex.ipynb. My solution is in chap04soln.ipynb. Exercise 1 How much did you weigh at birth? If you don’t know, call your mother or someone else who knows. Using the NSFG data (all live births), compute the distribution of birth weights and use it to find your percentile rank. If you were a first baby, find your percentile rank in the distribution for first babies. Otherwise use the distribution for others. If you are in the 90th percentile or higher, call your mother back and apologize. Exercise 2 The numbers generated by random.random are supposed to be uniform between 0 and 1; that is, every value in the range should have the same probability. Generate 1000 numbers from random.random and plot their PMF and CDF. Is the distribution uniform? percentile rank: The percentage of values in a distribution that are less than or equal to a given value. 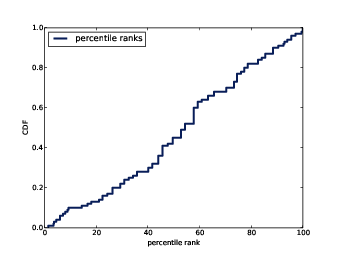 percentile: The value associated with a given percentile rank. cumulative distribution function (CDF): A function that maps from values to their cumulative probabilities. CDF(x) is the fraction of the sample less than or equal to x.
inverse CDF: A function that maps from a cumulative probability, p, to the corresponding value. median: The 50th percentile, often used as a measure of central tendency. interquartile range: The difference between the 75th and 25th percentiles, used as a measure of spread. quantile: A sequence of values that correspond to equally spaced percentile ranks; for example, the quartiles of a distribution are the 25th, 50th and 75th percentiles. replacement: A property of a sampling process. “With replacement” means that the same value can be chosen more than once; “without replacement” means that once a value is chosen, it is removed from the population.